Feb 25, 2018 Episode 00: Introduction to Data Viz Today! Welcome to episode 42 of Data Viz Today. Can we combine explanatory and exploratory data viz? That's just what Duncan Clark and his team over at Flourish are trying to accomplish by giving everyone the ability to create a "Talkie." In this episode, find out what it is and how to create an effective one. 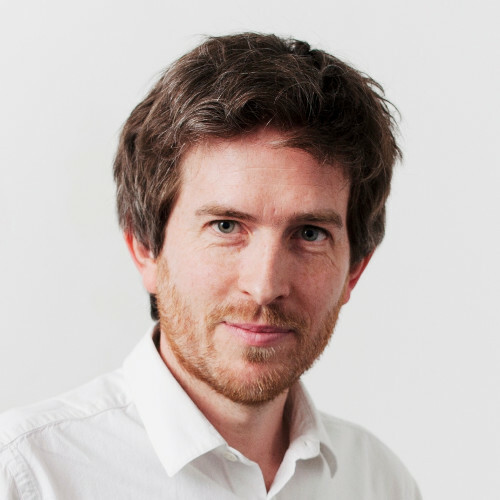 Bonus: Duncan shares the one thing that would impress him in a data viz portfolio! Carbon Map by Robin Houston and Duncan Clark - the original Talkie! Make a Talkie on Flourish! Welcome to episode 41 of Data Viz Today. Are you terrified of color? Me too! :) Sometimes there are just too many choices. So I’m going on a color diet! What is a color diet? Well, for me, it means to be more conscious about how I use color in my visualizations to make sure that I’m using color to solve a problem. In this episode, we’ll talk about how a color diet can improve your work, plus a few tips on how to get the most out of the few colors that you do use. Today is a mini episode where I talk about a data viz topic that I think is important. And today that topic is how to go on a color diet. What is a color diet? Well, for me, it means to be more conscious about how I use color in my visualizations to make sure that I’m using color to solve a problem and not just as visual entertainment. So in this episode, we’ll talk about how a color diet can improve your work, plus a few tips on how to get the most out of the few colors that you do use. I don’t have any formal design training, like many people in the data viz field, so I never learned the ins and outs of color like a lot of people who come from like a graphic design background. So my color evolution went from just accepting software defaults, to changing defaults to other colors based on my whim, to where I’m at now where for personal projects I like to find colors that first make sense for my data, like is a diverging color palette appropriate or can I group these categories in a reasonable way so I don’t have 100 colors? And then I find other colors that are complementary, or pleasing to the eye as needed and color-blind safe. One of my favorite ways to find color palettes is to the Google Art & Culture Art Palette site which shows the palettes of tons of artworks, and then run it through Susie Lu and Elijah Meeks’ Viz Palette tool to make sure there aren’t any color conflicts. But when it comes to picking color for work projects, I’m frozen into a panic. The choices feel super overwhelming the stakes seem so much higher. So I decided to go on a color diet and explore how to do more with less. The first step in going on a color diet is to design your visualizations without color, using a monochrome palette, which means displaying images in black and white or in varying tones of only one color. Think of a color ramp from white to black and all the grays in between. Another benefit is that the people you’re working with, clients, stakeholders, will start asking better questions when you show a monochrome design first. Anand says that you can have a conversation about what color works for which elements, rather than the conversation focusing on why you chose yellow. So first designing without thinking about color will help you focus on your layout, spacing, alignment, hierarchy. And it’ll also help you and your client focus on HOW you’re using color rather than which colors you’re using. That line I recently read in Scott Barinato’s new Good Charts Work Book, which is an amazing book that I’m working through with hands-on exercises. In the chapter about color, he wrote: “Think HOW, not WHICH.” And this itty bitty change in thinking was huge for me. It totally changed my perspective and anxiety around color. Instead of freaking out about WHICH colors to use, I first needed to think HOW. How will using color improve my reader’s understanding? How will this color in this spot make this viz more effective? When your goal is to use color to solve a problem, the choices are a lot easier. Do you have a line chart of temperatures in 10 cities? The software default will give you 10 nice bright colors for each, but HOW is color going to improve your reader’s understanding? Maybe your point is to show how your city compares to other cities, so 9 will be gray and your city will be blue. Color has helped focus your reader on your story. So how can you get the most out of using a monochrome palette, it can feel kind of restrictive at first, but I came across a presentation by the cartographer Daniel Huffman where he argues why you should design maps in monochrome. The presentation is only 10 minutes long, and definitely worth watching all the way through, but there were two tips in there about getting the most out of monochrome that I really liked. One tip is say you have a map and you make the water white and the land gray. That would be my initial instinct if I were going to only use a white to black ramp. But now, the grays you have left for everything else are limited. But, you can get those grays back, if you make the water and land both white, and you just give a glow to the land so it looks like it’s popping up away from the water, or add concentric water lines to the coastline. So your reader can distinguish between the two, but you still have your whole color ramp to use for other things. Another tip that Daniel had was to think about how you can use patterns, like diagonal lines or dots. This allows you to use one color of gray for a whole bunch of things. If you think about it, some other benefits of designing in monochrome is that you don’t even have to worry about whether people are going to understand your viz if it’s printed out in black and white, or if your palette is color-blind safe! My final takeaway is that designing your visualizations without color or in monochrome helps you in the design process by allowing you to focus on the layout and helps you focus on HOW color will help your reader. You can get the most out of using a monochrome palette by using techniques like glow or shadow, or using patterns. Once you max out your monochrome, think about how that one pop of red will make the HUGE impact you’re looking for. I’m looking forward to going on a color diet and pushing my monochrome limits. If you have a pro-tip on designing without color, I’d love to hear! I’m on twitter at DataVizToday. Join the Data Visualization Society HERE! Welcome to episode 40 of Data Viz Today. How can you add more information to your flow charts? Incorporate small multiples! In this episode, we learn about Chris DeMartini's data visualization that brings together small multiples and a flow chart (an NBA bracket) to add context to the flow. Find out how he created it, and how this technique can be applied elsewhere! 00:15 - Today’s episode is all about small multiples but with a twist. If you haven’t heard the term small multiples before, it’s a term popularized by Edward Tufte, and it just means when you have a bunch of smaller charts of the same type using the same scales and axis that are bunched together showing different partitions of the dataset. It allows you to quickly compare information. 00:46 - Recently I saw an interesting twist on small multiples, where Chris DeMartini incorporated small multiples into an NBA Playoffs bracket. He used the term Small Multiple Flows, which I’d never heard before, to describe when you add small multiples to a flow diagram. Even though I don’t have any interest in the NBA Playoffs, I began thinking about all the cool things you could do when you use that dead space of a flow chart or org chart or a timeline to add more detail. 01:31 - Today’s featured project is called “NBA Playoffs 2018” by Chris DeMartini. Chris runs the Data Visualization team at Visa. He also works with DataBlick on consulting, non-profit and R&D projects. He has been a Tableau Zen Master since 2016. 01:48 - Chris found himself a bit of a frustrated sports fan as he was following his favorite teams, like the Warriors, because when you look at sports brackets, you’re only getting the final result - who won and is advancing to the next round. But what if you want more info? Was it’s a blowout? Was it close? 02:10 - He got inspired by how FiveThirtyEight does their brackets, where if you hover over a team, their bracket path to the championship changes thickness based on how likely they are to advance at each stage. Chris got the idea that he could use a similar idea where he’d encode data from the actual game into the bracket’s structure. So his goal was to have a visualization of the NBA playoffs that would give you a quick look at who is advancing but also give you an idea of the quality of the match-up. 02:42 - He went through many iterations using pencil and paper to decide what information he’d encode and how he’d do it. Chris settled on a few things: First the line of the bracket was colored by the team that won the game, then the small multiple element encodes the (raw) cumulative score differential across for scoring play. So x axis is scoring play # and y axis is difference in total score as of that play. The chart is then encoded based on who has the lead on that play which carries through to lines, etc. So it’s really easy to see if there’s a lot of back and forth (data above the line, below the line) or if one team dominated. Then there were concentric circles behind each game to represent the number of wins for the team in that series. There’s a ton of info packed into this bracket! It’s a sports fan’s dream. 03:42 - He said he got a lot of inspiration on how to layer all this information from vizzes around the community, but mostly from a viz by Nadieh Bremer about a Japanese Comic where she encoded a lot of data about the comic in this circular chart. 04:01 - Once he figured out how he wanted to show all the info, he needed to implement it. He got the data from NBA.com and used Alteryx to get the data in a usable format. He said the data prep would’ve been the hardest part if it weren’t for Alteryx. Then he needed to execute all these encodings in Tableau. To do this, he used a technique that involves layering multiple tableau charts over each other. So in this case, he had one chart with the bracket and the colors of the lines of the brackets based on the winner, then another chart for the bars representing scoring plays, and another chart with the circles behind each game representing games won. 04:45 - He has a detailed blog post about how to do this technique and another one specifically how he created this NBA viz. You can also download his Tableau workbook to reverse engineer his Tableau wizardry. You can definitely tell why he’s a Zen Master when you open it up. 05:02 - So seeing Chris’ viz, really got me thinking about all the applications of this Small Multiples Flow chart. Like you could take something simple like the org chart of your team and use the lines and other elements to show extra information. Like if it’s a sales team, you can have a line chart associated with each person showing sales over time. 05:25 - Or you could have a flow chart of different paths people take on your website, and add a bar chart for how many times people press the Buy button while they’re on that page. So you could see the typical path a customer could take through the website, and see that people press the Buy button quickly after landing on this one particular page, and maybe they take longer to press Buy on a different page. 05:50 - It could also be a more simple flow chart, like events happening through time. Like it was recently President’s Day here in the US, and it got me thinking about Presidents and their approval rating. You could show the succession of presidents with their picture and name, and a line connecting each of them, so it’s a basic timeline of presidents, but in between each one is a small line chart showing the president’s approval rating throughout their presidency. Just this small tweak of making the timeline the main story of the graphic, and then adding data within that structure, is a really simple but interesting way to display your data. My inspired viz - timeline of recent US Presidents and their approval ratings in between. 06:40 - It might be cool to do something like this with networks too where nodes are connected with lines to show a relationship and there is another chart within those lines. 07:00 - My final takeaway is that if your main story is the flow of the information, that doesn’t mean you have to leave out contextual information. You can integrate small multiples into the structure and give your audience the benefit of seeing the overall flow and extra details. So check out your flow charts and use all that space to your advantage! 07:22 - Finally, I asked Chris what’s his advice to designers just starting out, and he said, “Just try it, don’t be shy, afraid or worried about what people think (which is easy to do these days, and I still do this constantly). Learn from others, be sure to site your sources and inspiration ALWAYS. Continue to evolve techniques and push viz forward in what you do.” Thank you Chris for sharing your inspiring project with us! 07:47 - You can follow him on twitter @demartsc. And check out his great blog posts on the datablick blog. Welcome to episode 39 of Data Viz Today. I’ve been on a mission to improve my design abilities, and there are three design tweaks that I’ve found to be really effective in making my visualizations look more professional. In this episode, I share these three tips that pack a punch! 00:15 - Today’s topic is 3 design tweaks that I’ve learned this past year that instantly improve the design of my visualizations. I’ll explain those three things, and I actually took an old chart that I had made and implemented these three things so you could see the difference. There are still a lot of things I’d change about that chart, but it’s interesting to see the transformation with just three tweaks. See below! 01:10 - First, alignment. I try to make sure everything that I put on a page is aligned with something else, or there’s a really specific reason why it’s not. Usually I find left alignment looks best, especially with bigger chunks of text. In Adobe Illustrator, I’m always setting up my graphic with straight guidelines that I can use to snap all my elements to. You could mimic this in powerpoint or tableau by drawing your own guidelines along the margins or between groups of information. In Tableau dashboards, you can toggle on a grid by pressing the G key, which is super helpful. So be aware of what each element is aligning with, and also an alignment that’s easy to overlook - the vertical and horizontal spacing between your elements. Make sure there’s consistent space between your elements as well. 02:10 - Second, text hierarchy. We talked about annotation hierarchy in episode 7 “How to Annotate Like a Boss” where you have a title, lead-in text right below it, then maybe subheaders and explanatory text within your chart to call attention to the points of interest. And all those text elements have an order that’s ideal for your audience to read them in. So how do you convey that order? Usually I go straight to size of the text, which definitely works well - bigger things are more important. And another option is weight. Many fonts of a light, regular, italic or bold option so you can layer those to create a hierarchy effect. Another way is color. One technique that I’ve been experimenting with is using a slightly lighter black, which can be easier to read that straight black, for the title, and then smaller text that’s grey for the subheader. Or for a white text that’s on a darker background, you can make text look less important by giving it a little transparency so it takes on a bit of the background color so it pops less than the white title. I’ve used this technique well with labeling. Like if I have a treemap and I’m labeling each segment with the category and the percentage, I write the category white and then the percentage in white with added transparency. It’s legible and cohesive because I’m not changing much, but it still gives a little hierarchy. 03:50 - Third, keep annotations simple. After doing episode 26 “How to Develop Your Design Eye” I realized how crazy I was with my annotations. You can see in the shownotes for that episode, I had created a viz for rainfall in DC and then I came across a similar viz by Jane Pong for rainfall in Hong Kong a few years earlier so I had the unique chance to directly compare what I created with something a pro created with a very similar dataset. And one big thing that stood out is that Jane had these really elegant and understated annotations calling out interesting days with short, slightly curved black lines and text within the chart, and by comparison, my annotations looks almost comical because the lines were really long and flowy leading out to text outside the chart and colored red! Then I also had these big clunky arrows along the axes as if people didn’t know which direction to read. So now, I keep my annotation lines as short as possible, with only one curve (not bending in and out and around), and in a consistent thickness. Like the line doesn’t start small and get bigger. I’ve noticed that when I use arrows or lines that do that, it looks more clip-arty. 05:30 - One resource that really helped me as a beginner is Canva’s Design School. They have a bunch of interactive tutorials and courses that do a good job of teaching some basics. 05:50 - My final takeaway is that there are a few design tweaks that can get a lot of mileage out of. And for me, those have been making sure each element is aligned with something else, make sure your text has hierarchy with size, weight or color, and lastly, keep the arrows and annotation lines simple. 06:30 - You can sign for my weekly newsletter that I send out every Sunday with top tips from the episode. I love mailing it out every week and getting your replies! 06:35 - I also have a resources page with my favorite books, blogs and podcasts. 06:45 - And I also have two online courses - one for creating your first custom map using Mapbox, and the other is a shortcut to learning how to create charts in Adobe Illustrator. Here is an example of those three tips applied to an old viz. There’s still a lot of changes I’d make now to this viz, but doesn’t the new one look a little more professional with better alignment, clear visual hierarchy, and simple annotations? What a year… I was honored to join Enrico Bertini and Moritz Stefaner on their Data Stories podcast along with Cole Nussbaumer Knaflic and Jon Schwabish to discuss our highlights from the year and what we hope to see in 2019. 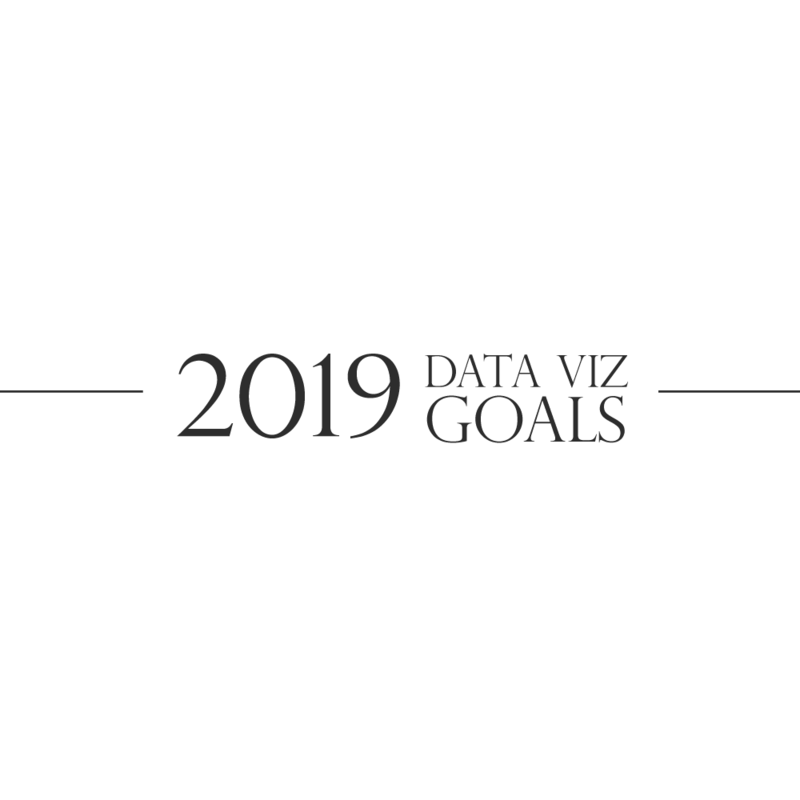 What are your data viz goals for 2019? Feel free to download the PDF that I use. I’d love to hear about your #goals! Welcome to episode 36 of Data Viz Today. Have you ever pushed the boundaries of visualization? Did you receive any push-back? Do you want to experiment more with new chart types, but you’re not sure where to start or maybe you’re worried about people’s reactions? In this episode, we’ll hear how Richie Lionell created his thought-provoking data viz, how he handled criticism gracefully, and how you can get started creating something new in spite of potential negative feedback. 00:23 - Today’s episode is all about experimenting with visualization and in turn receiving feedback and critiques on it. 01:20 - Today’s featured data viz is called “Senator Voting Patterns” by Richie Lionell. 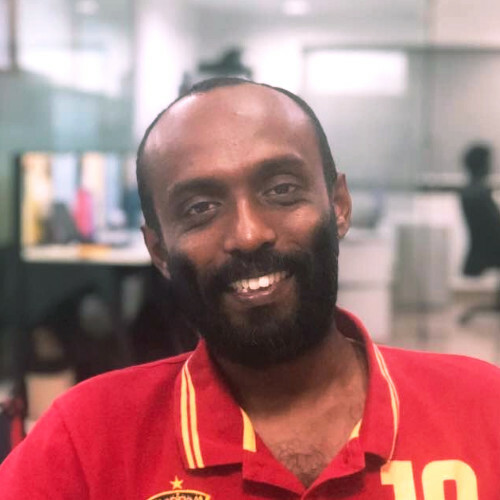 Richie heads the Story Labs at Gramener, a Data Science company based in India. 01:30 - He first came across senate voting data on the senate.gov website and was super excited to find it in a clean xml format, so he scraped the xml files and converted it to CSV. 01:42 - His very first thought was to find out how each senator’s voting pattern compared to the other senators. So he wrote a simple python script to compute the simple similarity score for every senator with every other senator. He did this by taking a sentor’s vote (yea or nay) for each issue and comparing it to every other sentor’s vote. 02:25 - Initially he tried conveying this story through a network layout, but it turned out to be really cluttered and hard to read. So he had start making some tough choices. He knew he couldn’t show all the information because it was just too complex, but it still needed to be interesting for people to explore. 02:51 - His big breakthrough came when he decided not to show a many-to-many network relationship and ditch the traditional network layout, and instead try a radial representation where one chosen senator would be placed at the center, and the other senators would be placed around him or her based on how similar their voting records were. 03:25 - So in his final visualization, Richie used Gramex to handle data & the user interface, and, D3.js for the visual representations. 04:28 - Like I mentioned, some people seemed to really like this viz and some people really did not like it. The biggest complaint seemed to be that the position of the senators around the circle was random - Richie just randomly positioned them around the circle so they wouldn’t overlap. Beau Harrison actually did a remake of the viz where he made the position around the circle the senator’s ideology score, which was interesting. Alberto Cairo liked it but did a remake of the viz as a scatter plot. 05:10 - Some people were a bit more harsh and found it difficult to comprehend the radial layout and thought that it was completely useless since the position around the circle didn’t mean anything. 05:20 - But Richie took it all in stride and was glad that it sparked debate, and actually found it really insightful to hear how different people perceived the viz - some people found it really hard to read and some people found it really intuitive, which gives us insight into how people understand visualizations. 05:33 - In the end, Richie was happy to have tried something new and achieved his goal of visualizing one interesting theme… he wasn’t trying to answer all the questions. But he did wrestle with creating a rich graphic that was still readable. It’s a tough balancing act that all data visualization designers have to contend with. 05:55 - So how can you experiment with new visualization techniques and how can you prepare yourself for the inevitable critique? 06:01 - I really loved watching Maarten Lambrecht’s OpenViz talk about Xenographics - he created an entire website where he compiles new and strange chart types, and in his talk he gave some tips on how you can create your own xenographics. One tip was take your chart and just flip the axes, another tip is to crossbreed two different chart types. Pick two that show the info you want to convey and try to integrate them into one chart. 07:25 - I dive more into visual metaphors in episode 14 if you’re interested in hearing more about that. 07:33 - So say you try out a new chart type and the critiques start rolling in… first, be prepared for it. There’s a reason why Maarten calls new charts xenographics - some people are scared of new charts and will automatically dislike it because it’s different. Second, keep in mind that creating something new is hard and most people completely underestimate the creativity and effort involved in it. 08:00 - I think following Richie’s mindset is the best way forward following critiques - know that some people will find it difficult to understand because it’s new, but their critiques are still valuable even if they don’t seem to understand what your goal was, because it’ll give you insight into how people are making sense of your visualization, which will help you in the future. 08:20 - My final takeaway is that we need people to experiment with new visualization techniques and chart types, and it’s tough being a pioneer - it takes creativity and effort, but it’s important to keep the data viz field moving forward. Just be ready to hear feedback on it, and try to take it as insight for your next viz. If you’re giving feedback, remember to critique respectfully. 08:52 - Listen for Richie’s advice to designers just starting out! Welcome to episode 35 of Data Viz Today. What should you do when you plot your data points and realize they're all on top of each other?? I recently learned that this is called "overplotting" and in this episode, I'll offer 3 techniques to help you handle this problem so you can get back to analyzing & visualizing! 00:30 - Today’s episode is about how to deal with overplotting. Overplotting is when you have a lot of data that overlaps each other in your chart. It’s difficult to see how much data there is and where it’s the most concentrated, which really hinders your analysis and obviously conveying your message visually. 01:15 - When I finally figured out that this was called overplotting, I was able to find a lot of great resources, specifically this article by Stephen Few with lots of ideas. 01:40 - So let’s talk a little more about what overplotting looks like and 3 solutions that you can test out next time you run up against this in your practice. 01:46 - Overplotting is pretty common in scatter plots and line charts when you have a large dataset and/or many points are plotted on the same or similar values, or when you’re plotting the values of some points and your x-axis is plotting a discrete variable (like something where there’s a finite number of possible categories), so you’ll end up with a lot of points in the same place. 03:00 - First, you can try aggregating the data. Maybe you don’t need to see every point or line, so consider whether showing something like an average or median would work for your goal. Similarly, you can filter your data in certain ways and create a series of small multiples. 03:35 - Second, you can try to convey where the density of your data is by adding a distribution chart on the margin of your scatter plot. So the actual data in the scatter plot stays the same, but there’s a distribution line on the side of the chart to convey where the points are the most dense. Similarly, you can create a contour plot which draws these kind of concentric circles underneath your data points and the circle centers around the densest areas and radiates out as it becomes less dense. 04:22 - Third, you can add some jitter to your points. That’s when you slightly alter the value of points that are close together so they don’t overlap, or overlap less. The points end up kind of huddled together rather than obscuring each other. A similar solution that I found is called the gatherplot. I stumbled across a research paper by Niklas Elmqvist and others that introduced the gatherplot, and it’s kind of like adding jitter to your points in a scatter plot, but then ordering the points in a more meaningful way. Think of like you have all your gridlines on your scatterplot, and whichever points fall within one cell are then lined up in an orderly way rather than jittered all around or overlapping. So you get the benefit of jittering because the points aren’t overlapping, but it’s a little more organized so you can compare the size of the grouped points more easily. 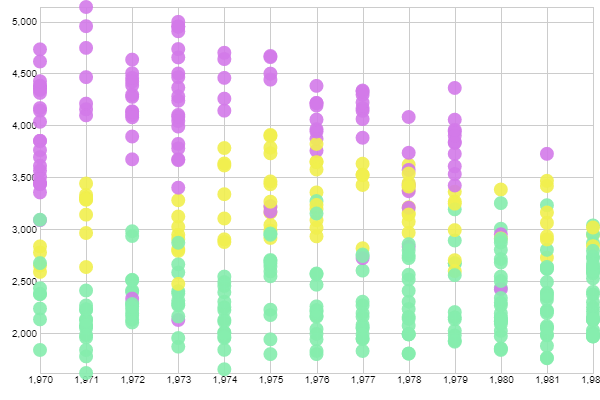 Plus if you’re coloring the points by some other variable, it makes it easier to compare the number of points of each color when they’re lined up and ordered within the cell, rather than jittered randomly. Welcome to episode 34 of Data Viz Today. When's the last time you saw a box plot? How about the last time you created one?! It's been a long time for me, but this week's featured data visualization by Eric William Lin has convinced me to reconsider using this often clinical chart type as a beautiful and powerful way to tell a story. In this episode, we'll hear how Eric built his Kantar IIB Shortlisted viz, plus a few suggestions for how and when you could try a box plot! 00:25 - Today’s episode is all about the classic chart type - the box plot! Also known as the box and whisker plot. We’ll talk about the visualization that inspired me to reconsider the beauty and functionality of a box plot, how it was built, plus a few suggestions how and when YOU could try a box plot! 01:10 - Eric is a musician-turned-software engineer based in New York City. 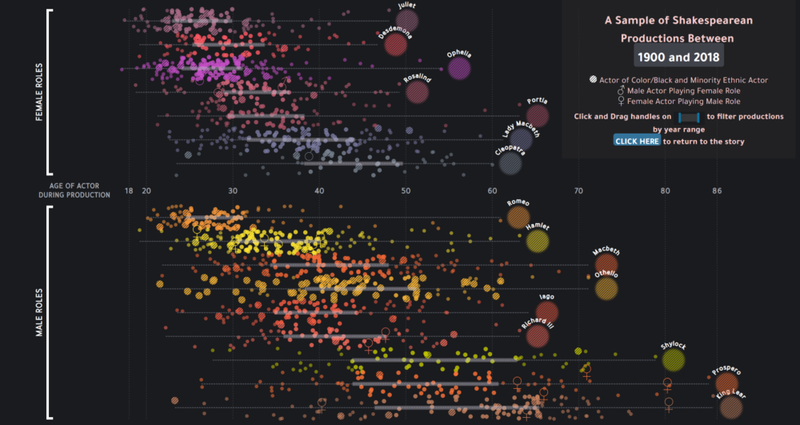 He occasionally teaches classes in programming and has recently become obsessed with designing data visualization, which has led to this featured visualization showing up on the shortlist for the Kantar Information is Beautiful Awards! Public voting is open til the 19th so vote for this viz! 02:15 - He began brainstorming about which plays to focus on and what would be an interesting angle, which can be a big struggle like we talked about in the last episode. 02:25 - But the first piece in the puzzle for Eric was that he remembered that the New York Philharmonic had open-sourced their performance history data, so while looking through the dataset, he decided to focus on Shakespeare plays, but with a twist - instead of focusing on the lines of text, he would focus on the characteristics of actors who have acted in those Shakespeare plays at over time. Like the age, gender and race of the actors. 02:55 - So he began gathering data for that, and said this turned out to be the most difficult part of the project. All that information was scattered around on different sites, in different formats, or not available at all. He had to scrape a lot of data from production websites using python, and deduce some actors ages from an old article that referenced their age and compare it to the production date of the play. 04:00 - His breakthrough moment was realizing that he could frame the story around the actor’s perspective. What if instead of looking at each character one-at-a-time and looking at how they were cast historically year-by-year, he could ask: As an actor, what roles are available to me at my current age? What roles should I audition for, and what characters would directors cast me in based on past data. 04:40 - This led him to the box plot - he could show the distribution of ages for each character side-by-side, and another innovative benefit of using the boxplot - he could slowly reveal the boxplot to tell a story of an aging actor - like now you’re 30 years old, you’re probably not going to be cast as Romeo or Juliet because 75% of actors who played those roles were under 30. 05:25 - Experience the viz here! 07:40 - Eric showed us that box plots can be beautiful and aid in storytelling, but let’s get a quick refresher on what a box plot is, and then we’ll talk about some pros/cons, and some variations. 07:53 - A boxplot is a standardized way of showing the distribution of data. It gives you a quick way to see how your data points are spread out. If someone told you the median of a dataset, you don’t know if most of the points are clumped around that value, or if they’re spread out. 09:55 - Pros: you can garner a lot of information about the distribution by these couple of marks, and they don’t take up a lot of room, so if you try show distribution with a histogram or a density plot, then it’s harder to put them all side by side and compare. But it’s easy to stack up box plots into one chart and compare distributions among various groups. 10:25 - Cons: The benefit of something like a histogram, is that you can see more detail. The box plot is using summary statistics, so you don’t have any control over the granularity, like you would with a histogram by varying the bin size. It also hides the sample size, so you might compare groups with separate box plots, but it could be a little misleading if your sample size for each group varies widely. You could annotate it, or I like what Eric did by actually showing the points with slightly transparent dots behind the box plot. The box plot is also less intuitive for some people, but you could mitigate that by doing what Eric did and show a How to Read chart beforehand. 11:25 - Check out box plot variations from Data Viz Catalogue! New York Times - they showed projected career earnings for college graduates, and they had a box plot for each major and you could see the median and the spread of the projected earnings in dollars for each one. FiveThirtyEight showed the median and spread of yelp reviews for restaurants with different Michelin Stars. I liked that they have an inset box that explains what the box plot shows. 13:20 - My final takeaway is that next time you’re visualizing the distribution of points and also want to compare distributions across many groups, consider using a box plot. It’s a clean way to show distributions, and you can experiment with different variations to show more detail, and even use it as a storytelling tool like Eric did! Just make sure your audience understands how to read it because it could’ve been a minute since they learned about box plots in math class. 13:30 - Listen for Eric’s amazing advice to designers just starting out! 14:55 - You can follow him on Twitter, and check out his website. 15:05 - I'm sharing my essential Adobe Illustrator tips in my new course! Check if it's right for you HERE!